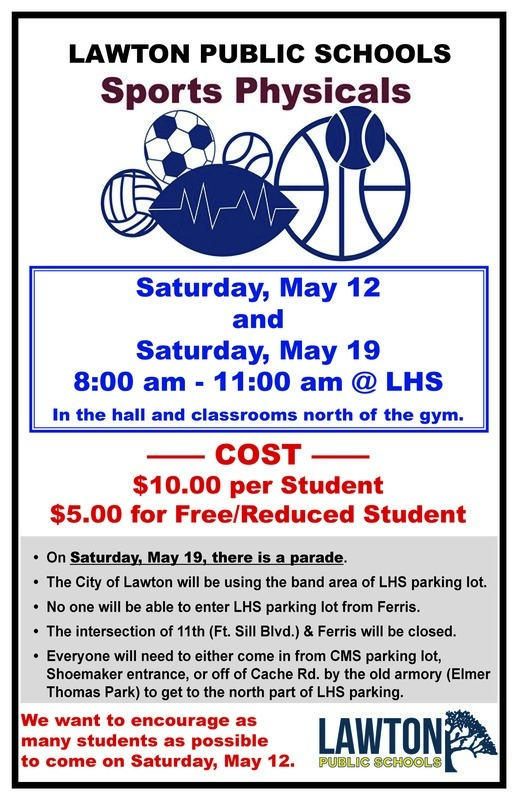 Physicals are scheduled for Saturday, May 12 and Saturday, May 19 from 8:00 – 11:00 at LHS. Attendees should go to the hall and classrooms north of the gym. The cost will be $10 per student and $5 for the Free/Reduced list. On Saturday, May 19, there is a parade. That means the City of Lawton will be using the band area of LHS parking lot. It also means no one will be able to enter LHS parking lot from Ferris. The intersection of 11th (Ft. Sill Blvd.) & Ferris will be closed. Everyone will need to either come in from CMS parking lot, Shoemaker entrance, or off of Cache Rd. by the armory to get to the north part of LHS parking. We want to encourage as many students as possible to come on Saturday, May 12.